WHITECHAPEL launches ‘Bring Me Home’ video! Ready to kick off ‘Impericion Never Say Die headline tour in Europe! WHITECHAPEL are ready to fly over to Europe to kickstart the IMPERICON NEVER SAY DIE! TOUR 2016 where the band will headline a plus 3-week run through 13 countries. Just one week away until the first show it’s the perfect time to premiere a brand new video. Surf over to tour sponsors Impericon at impericon-mag.com to check out the intense clip for ‘Bring Me Home’! 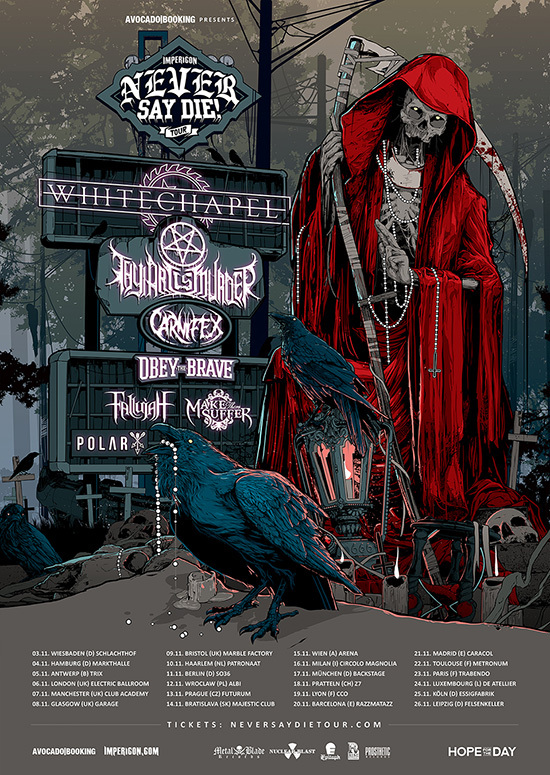 Do not miss WHITECHAPEL on the IMPERICON NEVER SAY DIE! TOUR 2016, the band is massively looking forward to this trip! “We are excited to return to Europe shortly with our new record and headline Never Say Die! 2016. We love Impericon and the Never Say Die! Tour so we’ve been looking forward to this since it was offered to us. The line up is solid and heavy so don’t miss this tour!” says Alex Wade from WHITECHAPEL! WHITECHAPEL released their sixth full-length, ‘Mark of the Blade‘, worldwide via Metal Blade Records on June, 24th. The album entered the official album charts in the USA (#15), Germany (#16), Canada (#22), Austria (#36) and Switzerland (#64). You can listen to songs and watch videos from ‘Mark of the Blade‘ at: metalblade.com/whitechapel – where the record can also be ordered in various formats. Reunited with producer Mark Lewis (The Black Dahlia Murder, Cannibal Corpse), WHITECHAPEL has redefined who they are and what they are capable of with their new album, ‘Mark of the Blade‘. Kicking off with ‘The Void’ – which has a Slayer-esque ferocity that is perfectly suited to the band’s three-guitar attack – the songs that follow all leave a distinct impression, and by the time the rich, dark melodies on ‘Decennium’ bring the record to a close, it’s impossible to deny the emotional weight brought to bear.